I don’t know about you but my kids are Star Wars obsessed. They live, eat and breathe Star Wars. I’m not really sure how it happened exactly. We watched the original 3 movies over the summer before Star Wars everything hit stores and they couldn’t get enough then. And now…well let’s just say having Star Wars themed items everywhere you turn is definitely fueling their Star Wars fan fire! 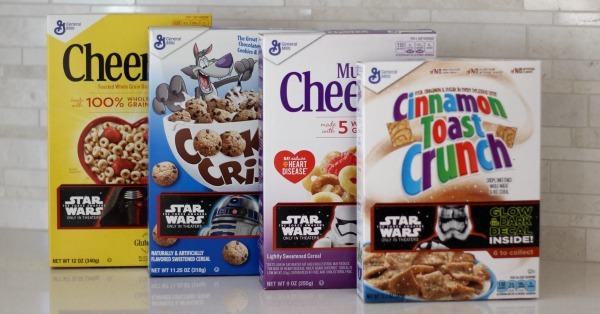 That’s why I was super excited to team up with General Mills to share about their new Star Wars: The Force Awakens decals. Because it doesn’t really get better than that. Big G Cereals + Star Wars? #Winning. It was all I could do to keep the animals at bay long enough to take a few pictures! The boys and I decided to get a little crafty with our awesome new decals and do a mini-playroom makeover. 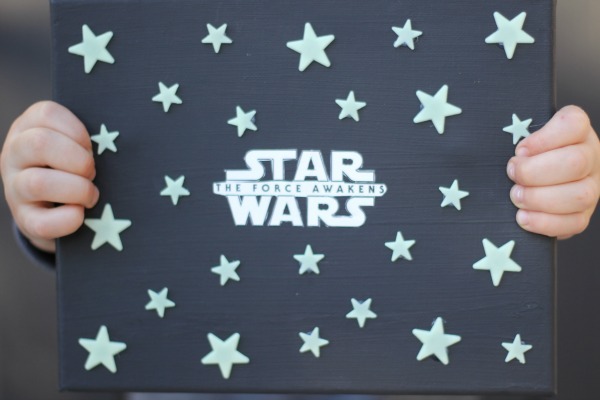 I grabbed an 8×10 Canvas and some paint and we made this super easy Star Wars Canvas Art. I thought it was a fun way to give the decals a little something extra. 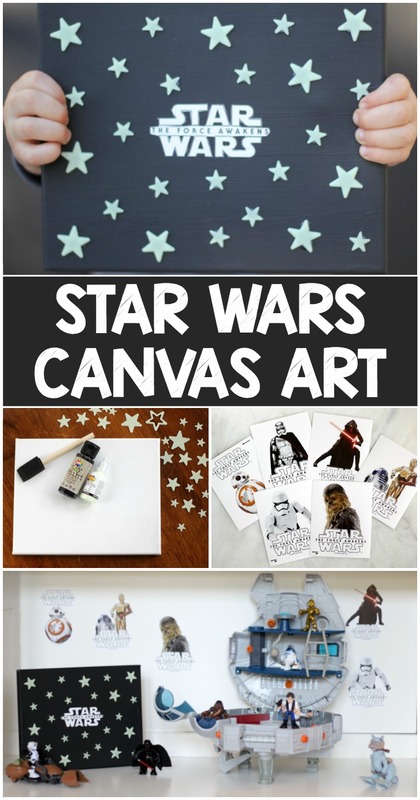 So, grab your glow-in-the dark decals and make your own easy Star Wars Canvas Art. Paint your canvas black. I did two coats on the top and one coat on the sides. If you like a more textured look you can get away with one coat on top. While the canvas is drying, cut out the Star Wars logo on one of your decals. You could do it quick and easy but I cut it close to blend as best I could into the canvas. 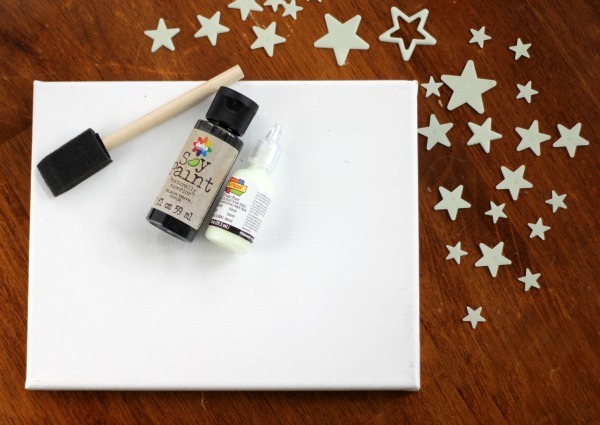 Once the canvas is completely dry, peel away the backing and place the Star Wars logo decal in the middle of your canvas. Next add the stars. I used the small ones and worked out from the middle. If your stars don’t have adhesive backing, you can use a glue gun or some Elmer’s Tac N’ Stik. Once you are finished you can hang it or display in your kid’s bedroom or playroom. See? I told you it was simple. My five-year-old even helped with this one. My kids love to move stuff around. That’s one reason I love the decals. You can move them a few times before they stop clinging. So they can re-decorate again and again! 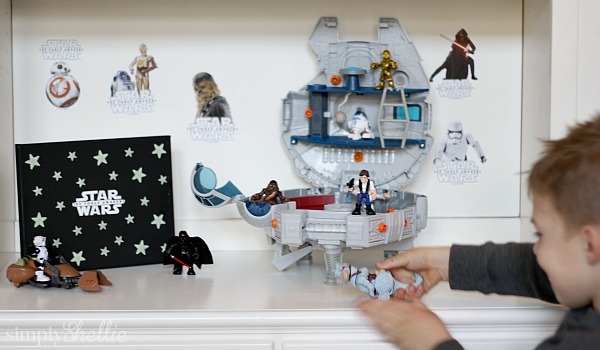 You will find the limited edition glow-in-the-dark Star Wars decals in your favorite Big G cereals. Specially marked boxes of Cinnamon Toast Crunch, Cookie Crisp, Cheerios and Cheerios Multi Grain include the exclusive decals. There are six in all featuring favorite characters R2-D2 & C-3PO, Chewbacca, BB-8, Kylo Ren, Captain Phasma and a Stormtrooper. 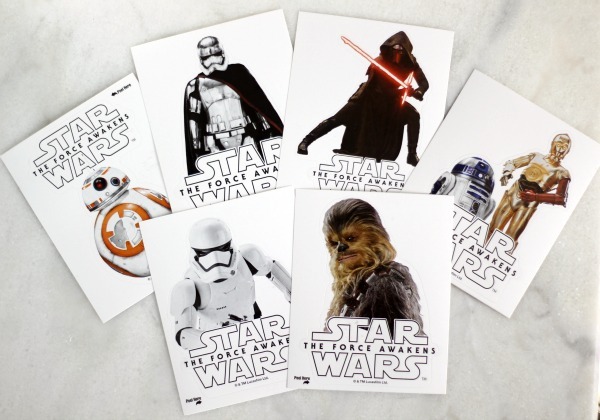 And if you want to make your own Easy Star Wars Canvas Art, be sure you are following General Mills on Twitter, Pinterest and Instagram for more galactic inspiration!